Indicator Rods are caliber specific. Indicator Rods use removable bushings just as our reamers do. Indicator Rods are for dialing in pre-chambered or re-chambered barrels. 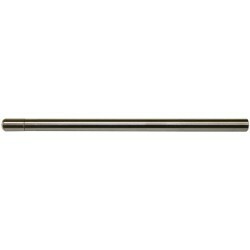 Indicator rods are 6” long made of steel and has a removable pilot bushing. It has an approx. 1” taper so that when inserted into a chambered barrel (designed for pre-chambered or re-chambered barrels) it will center itself in relation to the bore. A section of the rod will protrude from the bore this will enable you to align with the center point of the bore and gives you a fixed point that can be referenced prior to any operations. Each range rod is caliber specific and is available in all calibers. Note: To assure perfect concentricity and repeatability, please carefully slip the best fitting bushing on a 60° center reamer, and very carefully cull .008 out of bore to get any imperfections out so the rod will work perfectly.